Assessing the quality of scientific conferences is an important and useful service that can be provided by digital libraries and similar systems. This is specially true for fields such as Computer Science and Electric Engineering, where conference publications are crucial. However, the majority of the existing quality metrics, particularly those relying on bibliographic citations, has been proposed for measuring the quality of journals. 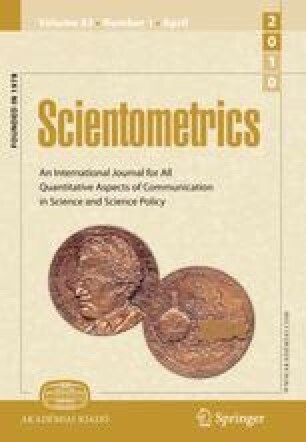 In this article we conduct a study about the relative performance of existing journal metrics in assessing the quality of scientific conferences. More importantly, departing from a deep analysis of the deficiencies of these metrics, we propose a new set of quality metrics especially designed to capture intrinsic and important aspects related to conferences, such as longevity, popularity, prestige, and periodicity. To demonstrate the effectiveness of the proposed metrics, we have conducted two sets of experiments that contrast their results against a “gold standard” produced by a large group of specialists. Our metrics obtained gains of more than 12% when compared to the most consistent journal quality metric and up to 58% when compared to standard metrics such as Thomson’s Impact Factor. This research is partially funded by the Brazilian National Institute of Science and Technology for the Web (MCT/CNPq Grant Number 573871/2008-6), by the InfoWeb project (grant number 55.0874/2007-0), and by the authors’s individual research grants from CNPq.